I am SO SO thankful for retailers that buck the notion that plus size women only want solid color basics. If you want me to get excited that you're offering the same piece in a bunch of colors, I simply cannot. 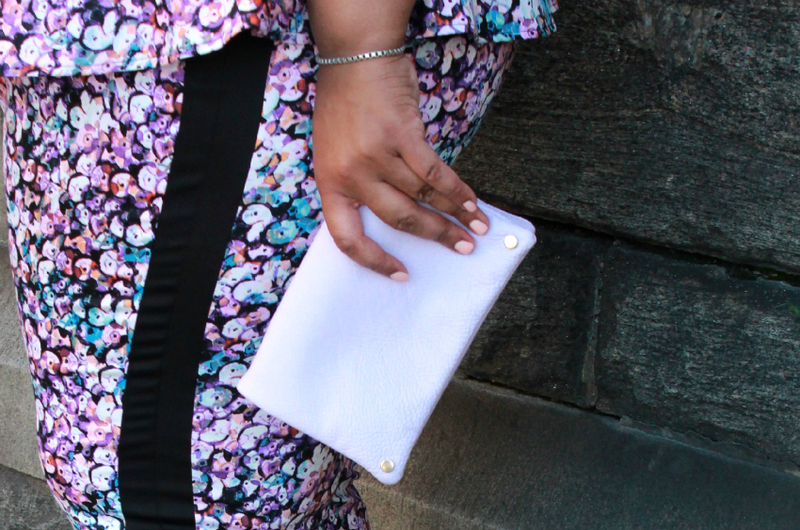 So, I often look to Simply Be for really current, on trend pieces. Generally I can always find something amazing - remember my moon print tunic? I mean, come on! Love! 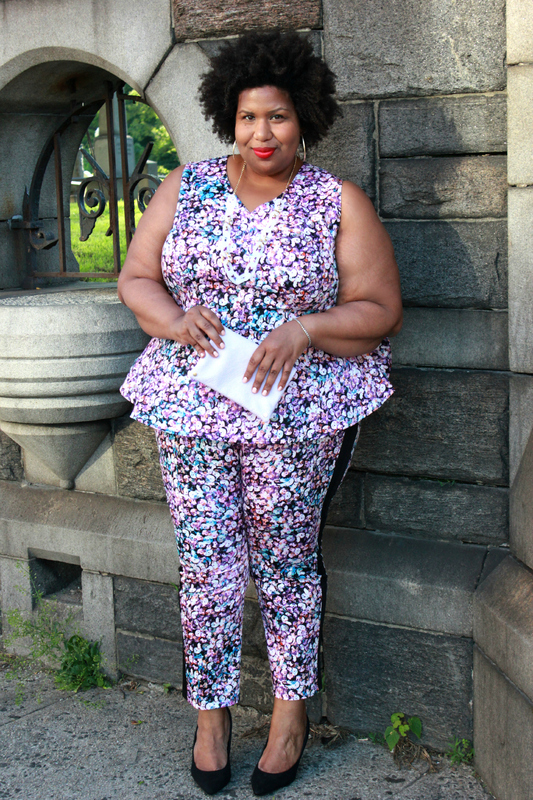 This sequined print peplum top and trousers begged to be in my life so of course I obliged. 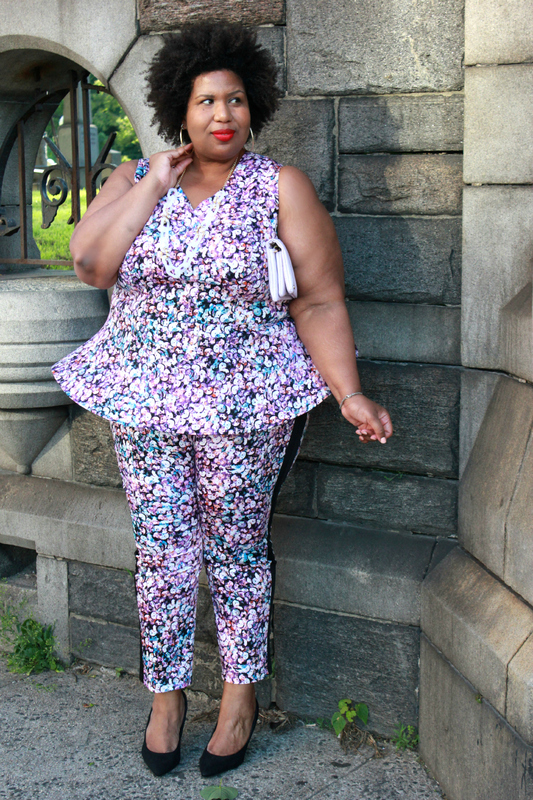 You know that head to toe prints are everything to me, this sequined print is so unusual and cool. Obviously that's what first caught my eye. Secondly, I can't get enough of tuxedo inspired pants, which can really be dressed up or down. About these pieces - they have little to no stretch, so don't order your "if it's stretchy size. order your true size. There's an enclosed back zipper on the top but I just left it closed and pulled it over my head. Easy enough. The pants have an elastic waist, I'm a bit thicker in the middle and it was really comfortable. If you have a more narrow waist and larger hips, you might have to do a little nipping to make the waist fit. Not sure, but that's my guess. Kind of a great to wear to a day time summer wedding. For me the set is a great option when you don't feel like wearing a dress.